NAVAL STATION GUANTANAMO BAY, Cuba — Navy Adm. Kurt W. Tidd, Commander, U.S. Southern Command, visited Joint Task Force Guantanamo Troopers to celebrate the Thanksgiving holiday as one of his final acts as commander, Nov. 22. Tidd was joined by incoming SOUTHCOM Commander, Navy Adm. Craig S. Faller; Marine Sgt. 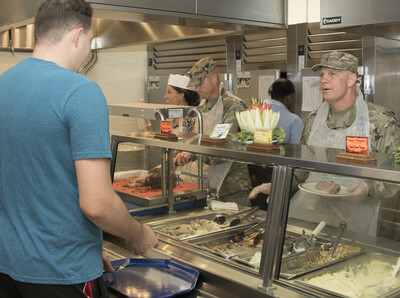 Maj. Bryan K. Zickefoose, SOUTHCOM Command Senior Enlisted Leader; and JTF GTMO leaders, to visit Troopers on duty and serve Thanksgiving lunch at the Camp America Galley. One Trooper shared what seeing leadership during the holidays meant to him. Tidd, who will retire next week after more than 40 years of service, expressed his gratitude at being able to spend his Thanksgiving with JTF Troopers. Faller will assume command of SOUTHCOM early next week.